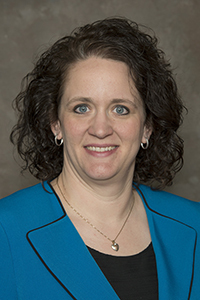 Bemidji State University Registrar Michelle Frenzel has been nominated for the 2015 Minnesota State Colleges and Universities Board of Trustees Professional Excellence Award for Administrative Service Faculty. The award proclaims, on behalf of the entire system, the Board of Trustees’ pride in the dedication and accomplishment of service faculty in contributing to students’ growth and development. Frenzel is one of six outstanding nominees for the award. The MnSCU Board of Trustees and Chancellor Steven Rosenstone will honor the nominees during an April 22 luncheon in St. Paul. The recipient of the Professional Excellence for ASF award will receive a cash award of $5,000. The award is intended to recognize outstanding service to our universities and to the Minnesota State Colleges and Universities system. Each university president may request nominations from a campus nominations committee and then designate one Professional Excellence Award nominee to the Board of Trustees. Nominees must have been employed for a minimum of five consecutive years with a Minnesota State university. Of these five years, the two most recent years must be in the ASF member’s current position. The remaining three years must be either in any position within the university in which the individual is currently employed, or in any ASF position at any Minnesota State university.